Last week I was walking down the road I live on with my best friend, in search of brunch at four in the afternoon (I’m a student and it was my day off, he’s unemployed, so at least please don’t judge me for this!) when he started complaining about my footwear. Granted, my feet did look pretty bad. I was wearing my Uggs, but these were my Uggs that needed replacing literally months ago. The stitching was coming away at the seems down the side, one boot was worn down on the heel at the point where I was trailing shredded bits of the piping between the sole and the boot behind me, the suede had come away from the sole on the other boot so I had a big gaping hole appearing every time I lifted my foot to take a step. All of this was causing me to drag my feet somewhat, which was really what was irritating him. Luckily, I could point out to him that I already had a new pair on their way, but if truth be told I’d been wearing them like that for months. 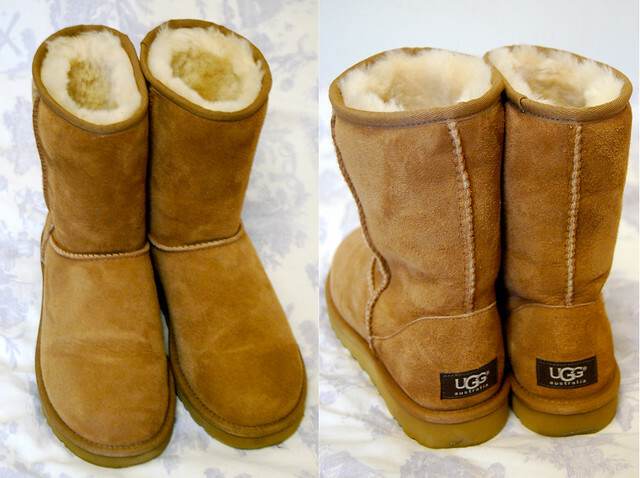 Some people absolutely love Uggs, and some people absolutely hate them. Honestly, I’m going to be hypocritical here and say that there is almost nothing worse footwear wise (why did they invent Crocs, if not to make something worse than ruined Uggs) than a pair of trodden down, dirty and totally worn Uggs that look slovenly and cause the wearer to epically drag their feet. I was doing it because as a student I don’t really have £170-£180 to shell out for a new pair of boots, I’m of the opinion that the cheap knock-offs wear down and look bad quickly (as well as having read that they are also very bad for your feet, where as the real deal are designed to bear supporting your foot in mind) and I had no other winter shoes that I could just slip on and off to run around campus in. If the wonderful people at shoe site Spartoo had not given me some vouchers so I could get a new pair, I would probably still be dragging my feet around campus in my old, horrid and ragged ones. I’ve personally always liked Uggs, but how about you guys? Do you wear them? Do you like how they look on other people? The only time I really hate clean nice Uggs being worn is if they’re being worn by men. I don’t think that I’ll ever think that that looks good!